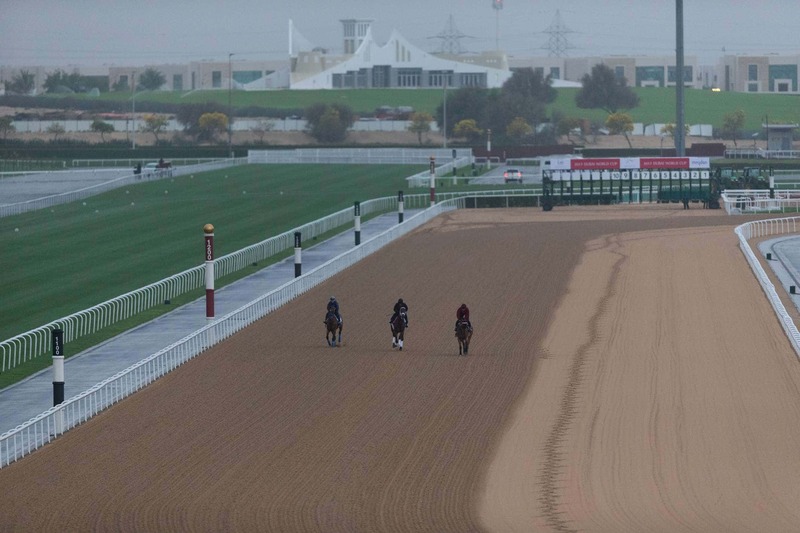 Trackwork Notes from the team of journalists with Dubai Racing Club, with updates on and build -up to all nine races to be held Dubai World Cup Day at Meydan Racecourse. Gun Runner (USA) — Continues to impress in the mornings for trainer Steve Asmussen. Left the quarantine facility and arrived at the main track at 5.05 am. He went on to gallop one circuit under exercise rider Carlos Rosas and then walked went back to his barn. Assistant trainer Scott Blasi, on horseback, escorted him to and from the racetrack. Arrogate (USA) – Made his way to the main track at 5am. “We try to keep him as quiet as we can. He knows that, with the way we’ve been bringing him along, that he’s getting close to a race, and he thought maybe he was going to work today,” trainer Bob Baffert said. Looking forward to Saturday’s Dubai World Cup, Baffert added: “It’s a huge challenge; I don’t think it’s going to be easy. There are some really nice horses here, and you’ve got horses from Japan and everywhere and you just don’t know who is going to do what in the race. There is a lot of speed and all that, but (the winner will be) whoever shows up that night. Also watching Arrogate train on Friday were Juddmonte’s American and European racing managers, Garrett O’Rourke and Teddy Grimthorpe, respectively. “This is the reason we come into this sport – these are the great moments. To see him looking so good and to see him standing there with that sort of look of eagles – isn’t this exciting? It really is,” Grimthorpe said. Hoppertunity (USA)— Galloped energetically around the main track under the direction of exercise rider Dana Barnes. “He really seemed to be having fun,” said Barnes’s husband, Jimmy, who oversaw the move after 7am for trainer Bob Baffert. Keen Ice (USA) — Went out for a smooth, leisurely gallop around the main track before the 7am training session. “He went around there nice and easy. I tried to keep him as relaxed as possible so he could save all his energy for tomorrow,” said exercise rider Nick Bush. “He came back (to the quarantine barn area) rearing, he was so fresh,” said Bush. Trainer Todd Pletcher’s assistant Ginny DePasquale handled the three-horse contingent, and she said on Friday morning that the trio continue to appear in outstanding health. “I think happy horses run well and they’re all happy, so we’re looking forward to tomorrow night,” DePasquale said. Neolithic (USA)—Galloped around 5am to get more experience with the racetrack while the floodlights were on, as they will be on Saturday evening. Neolithic galloped about 2200m, following the same pattern that Pletcher has designed for all three of his runners on each day this week. Awardee (JPN) and Lani (USA) – Cantered for two laps on the main track. Ribchester (IRE) continued to figure among the early-risers in the international stables, taking to the main dirt track shortly after 5am. As they have done all week, the Group 1 Prix Jacques le Marois winner and work rider Matt Ennis cantered steadily for a circuit. “Keep it simple, that’s the best way for him,” Ennis said. Mondialiste (IRE) headed to Meydan’s main track for the second morning in a row, but whereas the day before he was asked to quicken near the end of a steady piece of work, he hardly broke sweat on Friday. Mondialiste figures among the entries made this week for the QEII Cup and Champions Mile in Hong Kong next month. Decorated Knight (GB), who will be defending trainer Roger Charlton’s unblemished record in Group 1 races at Meydan, went a very steady pace round one circuit of the dirt training track. Deauville (IRE), one of three sons of Galileo in the Aidan O’Brien team, went third in line behind Highland Reel (IRE) as the party had their second outing to the Meydan main dirt track. Deauville, who is Ryan Moore’s pick from the stable’s three runners in the race, ran over longer distances in his four outings as a three-year-old, winning the Belmont Derby and ending the season in mid-August with a half-length third place behind Mondialiste in the Arlington Million. Cougar Mountain (IRE), who followed immediately behind Highland Reel (IRE) at exercise on the main dirt track, is the exception among the nine-strong squad assembled by trainer Aidan O’Brien for the Dubai World Cup programme in that he has already raced overseas this winter. Ridden by Saturday’s jockey, the trainer’s son Donnacha, he failed by a diminishing half-length to overcome an unfavourable draw in Qatar late last month. Long Island Sound (USA) – Among the Aidan O’Brien-trained runners in the race, was given sixth place in the dirt-track exercise string behind Highland Reel (IRE). One of three sons of War Front in the nine-strong team, he was unraced as a two-year-old and rounded off his seven races at three by claiming his third win, at Dundalk over 2100m. He will be ridden by Seamie Heffernan, whose only previous Dubai World Cup night ride, Festive Cheer, finished 13th in the Dubai Sheema Classic three years ago. Mutakayyef (GB) – The Ascot Summer Mile winner was walked from quarantine to the training track and back to keep him ticking over. Opal Tiara (IRE) – Regular work rider Lesley White gave Mick Channon’s filly light exercise on her final morning before she bids to supplement her Balanchine success. Vivlos (JPN) – Jockey Joao Moreira gave her an easy canter on the dirt course. Owner Hirotsugu Sasaki, a former Major League baseball pitcher, said: “I visited the barn yesterday, and she looked well and fit. She is in good form and the trainer (Yasuo Tomomichi) has confidence in her condition at the moment. “The trainer and I have been talking targeting this race since Vivlos won the last leg of the Fillies’ Triple Crown race last fall. It surprised me a lot that Joao Moreira, who worked her for the first time ever, understood her so quickly. He is an amazing jockey. Vivlos has a dual Group 1-winning full sister named Verxina and I think Vivlos has a same kind of good character as she is a really keen and gutsy type of horse. Jack Hobbs (GB) – Had a light canter around the grass track just after 5am ahead of tomorrow’s race. Highland Reel (IRE)/Seventh Heaven (IRE) – led out the nine-strong Aidan O’Brien- trained team, with the filly Seventh Heaven (IRE) bringing up the rear, as they emerged in single file on the Meydan main dirt track. O’Brien’s personal travel plans were scuppered by snow in Ireland on Tuesday, forcing him to revise the week’s schedule for his home-trained horses. However, his wife Anne-Marie and daughter Sarah reached Dubai in time to receive the stable’s Best Trainer award at the inaugural Sheikh Mohammed bin Rashid Al Maktoum Horse Racing Excellence Awards on Thursday evening, and were on hand at Meydan to cast their eyes over Ballydoyle’s biggest-ever challenge on Dubai World Cup night. Partnered by their regular work riders, the string repeated Thursday’s exercise, filing past the empty stands for a lap of the dirt track at walking pace, before turning to canter left-handed for a circuit at a slightly quicker pace than on the previous day. Postponed (IRE) – Trainer Roger Varian watched the six-year-old enjoy a leg stretch on the training track with his usual work horse. Sounds Of Earth (JPN) – Cantered for a lap on the main track under work rider Masaoki Nakata. Mind Your Biscuits (USA) – Went through his final preparations for Saturday’s race. Stallwalkin’ Dude (USA) — Appeared no worse for wear one day after blowing out 600m in 38 seconds. With Howard Jacobson, assistant trainer, looking on, he walked the shed row with a day remaining until he competes in the 1200m dash. “He came out of the work great,” Jacobson said. Dundonnell (USA) – The seven-year-old gelding did not visit the main track. St Joe Bay (USA) – Out for a trot and a hack around on the training track in the quarantine facility. Get our FREE picks for the Dubai World Cup! The Right Man (FR) – The first of the French raiders to make an appearance on the main track at Meydan on Friday morning and cantered once round the track. Long On Value (USA) – Riley Mott, assistant trainer, said: “We just sent him off the right way and had a regular gallop, about (1800m), and that’s that. We’re just going to have a little bit of a light day tomorrow, jog at the quarantine centre, and then lead him over there and run him. Final Venture (GB) – Trainer Paul Midgley kept the five-year-old inside the quarantine centre this morning with his main gallops having been completed last week. Richard’s Boy (USA) – Was out for a trot and a canter on the training track in the quarantine facility. Vettori Kin (BRZ) – Had his final 2400m gallop on the Meydan dirt track and trainer Kenny McPeek said: “He’s just drilled the feed tub and you can see on the track how fluid he is. I think he’s got a pretty big chance. “This is maybe one of the best horses I’ve bought out of South America. He has a huge future and we’re really excited about him. Master Plan (USA) – Galloping over the main track, he showed his connections that not only is he ready for Saturday’s race, he will not mind if rains continue and the track is wet. “He looked like he really enjoyed some moisture in the track,” said Ginny DePasquale, assistant to trainer Todd Pletcher. Ross (IRE) – Ridden by Patrick Gibson, he came out on the main track and German trainer Peter Schiergen watched him canter once round. Gifted Master (IRE) – Ahead of his race debut on the dirt, Hugo Palmer’s four-year-old had a gentle canter on the surface under the lights. “He just did an easy bit this morning and I am looking forward to seeing how he gets on tomorrow,” said trainer Hugo Palmer. Triple Nine (KOR) – Had a 2000m canter. “He has very explosive power when he changes leads,” said Ryu Seungho, senior manager of international races and relations of the Korean Racing Authority. Wall Of Fire (IRE) – William Buick was again on the Melrose Stakes winner and the pair covered a lap of the main turf track. Big Orange (GB) – Enjoyed a leisurely stroll in the quarantine facility. “He had a lead out,” said trainer Michael Bell.